The WisCOSH Board of Directors meet on a monthly basis and our meetings are open to WisCOSH members and the general public. The meetings are normally held at the WisCOSH Office, 3427 W. St. Paul Ave., Milwaukee, WI 53208. For further detail call (414) 933-2338. As in past years WisCOSH is preparing to host a communal meal and a commemorative ceremony. Plans are underway with the Milwaukee Area Labor Council (MALC) and the Waukesha County Labor Council (WCLC)and workers to honor those workers unable to return home at the end of their workshift or that passed prematurely due to workplace exposures. If you know of any workers that either died on the job or from workplace exposures please contact WisCOSH so we can be sure to include them. You can find a flier for Workers' Memorial Day in Milwaukee here. Just a short walk from the American Postal Workers Union hall the commemoration of those workers lost to workplace incident, exposures and illnesses will be held at Zeidler Union Square Park (located at Michigan and 4th St., Milwaukee, WI). This will be the second year holding it there since WisCOSH, Milwaukee Area Labor Council and Waukesha County Labor Council worked to revitalize and renew the park and the gazeebo. Updated information will be posted on the Facebook Events page which can be found herehttps://tinyurl.com/yye55dbx. Fight Like Hell for The Living! WisCOSH will hold the annual fundraiser dinner at American Postal Workers Union Hall [417 N. 3rd St., Milwaukee, WI 53203]. After dining WisCOSH will take a look ahead to how workers can organize around the unsafe work and unhealthy conditions they are forced to spend their day in just to pay rent, buy food, and hope to not need their health insurance. Updated information will be posted on our Events page which can be found here https://tinyurl.com/y6fy9qh7. 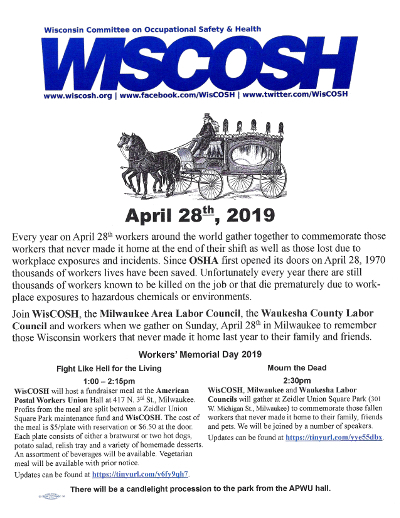 WisCOSH is planning several events for Workers' Memorial Week of Action and we will tell you about them as we get more details. 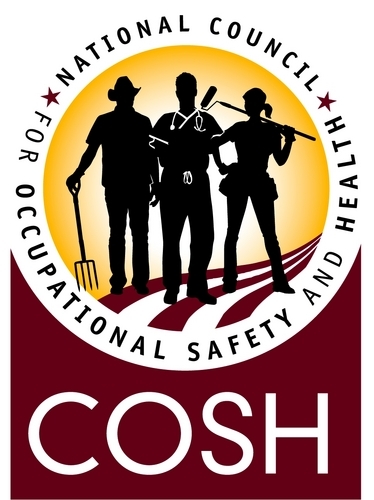 For the past several years the National COSH and WisCOSH have been trying to bring more attention to the loss of workers' lives due to unsafe work and/or unhealthy working conditions by highlighting the 4,000 to 6,000 workers that are known to die each year due to workplace incident or exposures. WisCOSH has expanded our activities beyond Workers' Memorial Day to a week of actions. In the past WisCOSH has held a number of activities such as spending a day in Washington D.C. where we took a contingent of injured workers to speak with their Congressional representatives. This year WisCOSH is hosting special screenings of the documentary film A Day's Work which WisCOSH presented at Workers' Memorial Day in 2015. Since that screening WisCOSH has continued to recieve requests to show it again. This year ... More information here. Workers' Memorial Day is being commemorated around the state by families, coworkers, friends and communities. As soon as WisCOSH is informed of the time and location of the many Workers' Memmorial Day events we will post them here so you can find the nearest one to you and join in. commemorating those workers that never made it home last year. If you are planning an event in your area please contact us so WisCOSH can help promote it and increase turnout. WisCOSH will post pictures of events here once they happen so check back in a little more than a month.